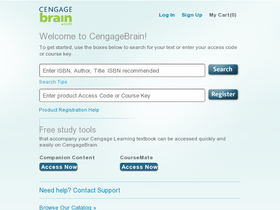 CengageBrain, online at cengagebrain.com, is one of the world's largest providers of learning solutions. CengageBrain offers students and educators a wide range of educational course material, including textbooks, eBooks, study tools, digital solutions, eChapters, and textbook rentals at discounted prices. CengageBrain also carries resume building tools, online homework solutions, such as OWL, CNOW, Aplia, and free student resources, like study guides and quizzes. So learn more while paying less, and get all the latest cengagebrain.com discounts, Cengage Brain promotions, and Cengage Brain coupon codes found here at RetailSteal.com. Shop at CengageBrain and enjoy $5 savings on orders $50+. Click here for code. Save $10 on your purchase from CengageBrain. Use coupon code on purchases $100 or more. Save 40% on job and career resources from Cengage Brain. Click here and use coupon code to get started. Shop at CengageBrain and enjoy free shipping on orders $25+. Click here to shop. Enjoy free shipping on your purchase from Cengage Brain. Offer for purchases over $25. Save up to 70% or more on eBooks and rentals from CengageBrain.com. Click here to find the books you need. Save up to 40% on closeout textbooks from CengageBrain. Click link to shop today. Shop at CengageBrain and enjoy a 15% discount on the list price of print textbooks. Click here to shop. Shop at CengageBrain and enjoy up to 50% savings on college textbooks. Click to shop. Enjoy free shipping both ways when you rent college textbooks from Campus Book Rentals. Visit EssayEdge.com and get free sample essays. Click link now. Shop online at BookByte.com and enjoy free shipping on your order of $49+. Offer includes Bookbyte’s inventory only, and excludes marketplace and dropshipped items.